Yet after that things got less straightforward. In the second stint Lewis started to take bites out of his team mate's advantage. And it became clear too that Nico was not in a tyre and fuel saving cruise mode as he was for spells in Brazil last time out, instead he had a problem with his front right tyre graining. By lap 29 the gap was down to just over a second where it hovered as Lewis got into Nico's turbulence. 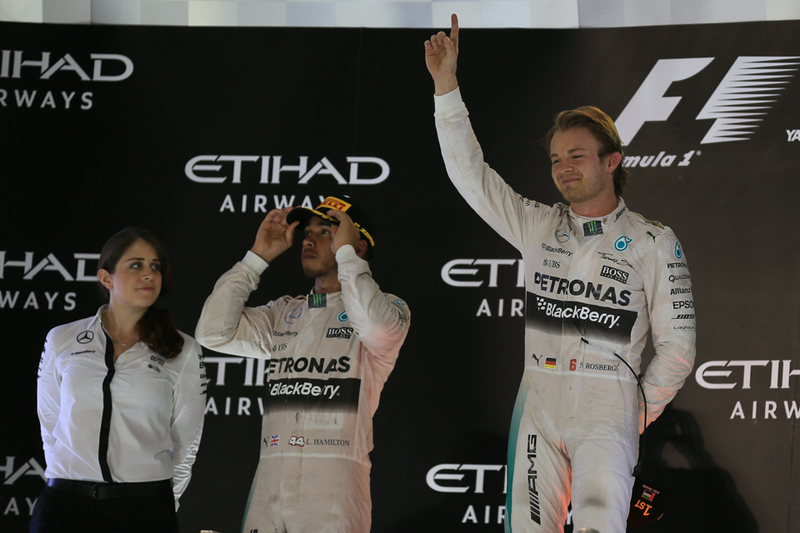 But then - that advantage from leading again - Nico bailed and pitted for the second and presumably final time. The race between them then developed a curious air. 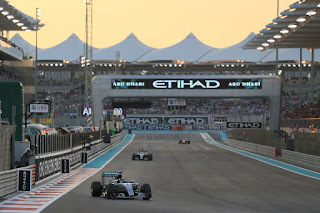 While the Mercedes team got criticised for its strategy restraint last time out where it appeared to require Lewis to shadow Nico's approach, it got rather lost then that the team did allow a car to extend a stint for the purposes of what in the parlance is called 'offsetting', when you pit later than a car you're chasing on order to be able to attack them on fresher tyres later - though such was Lewis' tyre wear in Interlagos the point became moot. But this time this was precisely what Lewis was trying as he pressed on. And on. His engineer too confirmed as much: "OK Lewis we're going to try to extend the stint" we heard him say. But if anything they extended it rather too much as Lewis went on a whole ten laps longer on his old tyres; before he finally stopped he was losing anything up to two seconds a lap. Lewis asked about pushing to the end on that set, but that looked not in the least bit a goer. And by the time he'd bolted on new boots he simply had too much to do - something like 12 seconds to make up on Nico with ten laps left. He tried for a while but after losing out in some traffic with five tours left as well as with his tyres going off he settled for second. This left a couple of controversies, first of why Lewis was left out so long and second why when he was brought in he was put on the soft rather than the supersoft tyres. The first point was the more difficult to discern. Lewis said something on the podium suggesting he was minded to push to the end, though later he said he'd simply pitted when the team told him to. "You have to rely on the engineers to give you the optimum strategy at that point," he said. "Honestly I don't really understand it." On the latter point it was certainly doable to make the end on supersofts, though Sebastian Vettel for one who used that compound for a similar final stint said he experienced heavy graining. And Mercedes insists it gave Lewis an option to choose which compound he used, but he didn't pick one so the team selected for him (it's a criticism made of him before that he's not quite as proactive on such matters as other top-level drivers). And Lewis seemed to confirm as much later. "I left the team to make the call because I didn't know what was the right one [tyre compound]" he said. "I'm not sure which one was better but the prime tyre was quite good. I'm not sure whether or not I could have taken it to the end but some part of me just wishes I'd just given it a go. "At the end of the day the gap was way too big. We left it too big. Particularly on the same tyres, there's no way you're going to be able to catch that gap up." So unlike in Brazil perhaps there wasn't much to see here. And it does seem that despite the latest round of criticism Mercedes allowed its drivers off the leash this time. With this result Nico also did that thing we all speculated about in advance - that he ended the campaign with three wins on the bounce as well as six poles, and perhaps more importantly it did nothing done to halt the wave he's riding on before everyone goes into their downtime. 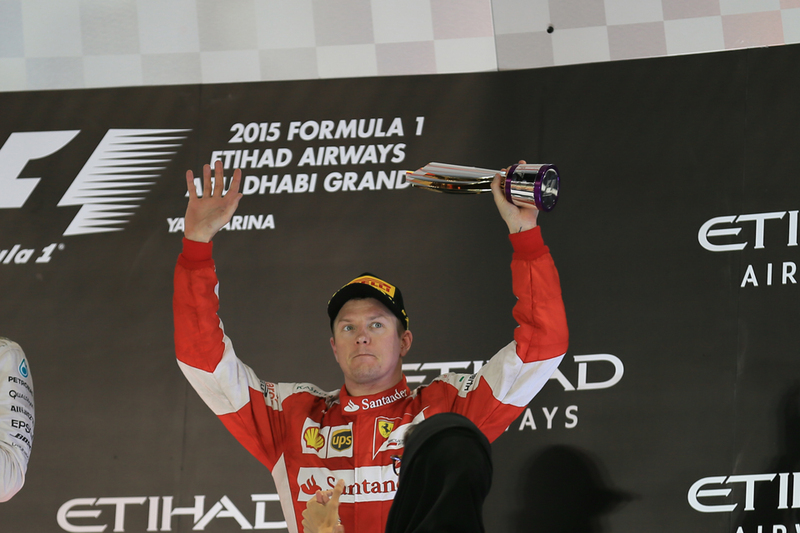 "Next season could start tomorrow.." he beamed on the podium, to sum up his great form. And just like in Brazil the exterior grumbling should not detract from him Getting The Job Done and managing the race out front superbly. 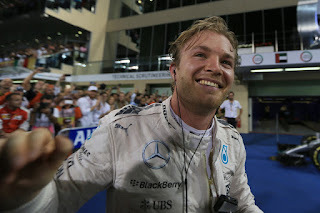 He was spectacular in qualifying which as mentioned gives you a great advantage and even more of one at Merc. Just like in Brazil too it's far from clear whether Lewis could have usurped him even with an alternative approach. "Yeah, for sure, ecstatic with the way it went" Nico added later, "because really master-managed... controlled the pace through the race and managed my tyres and used them optimally and pushed all the way through to the end, so had good pace there with tyres that's for sure and had a lot more laps on them than Lewis's so very pleased with that, definitely." We also were treated to our latest round of sparring over which Merc pilot sits the prettiest as we enter the close season stasis. "I'm feeling very happy" said Nico. 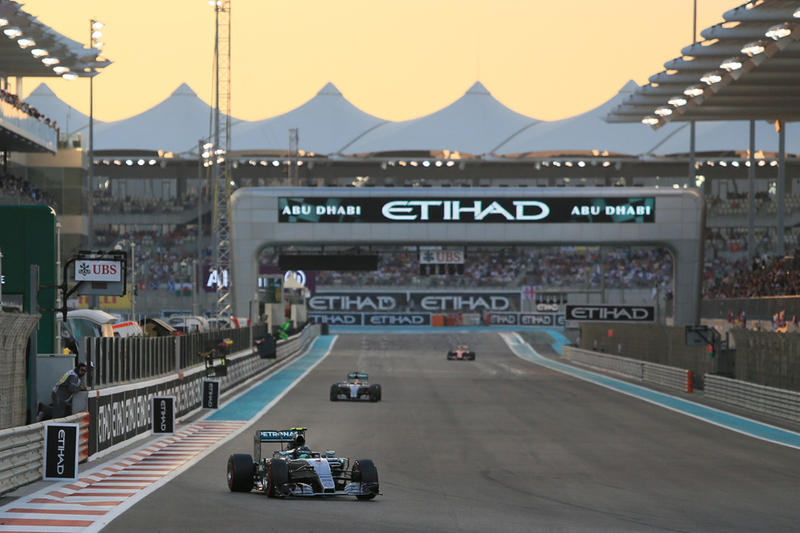 "I think being World Champion sounds a lot better than winning the race" countered Lewis. And, you know what, we managed to add yet another theory on why the recent results have gone Nico's way, as Lewis said in the post-race press conference "I'm looking forward to next year, to come back fit and healthy". Was, some speculated, Lewis saying he's been carrying some sort of illness in the year's latter part? The plot thickens yet further. Whatever is the case though all of a sudden, for the first time in well over a year, we enter 2016 with something like a credible fight between the two Mercedes drivers, or at least the potential of one. Perhaps it's just as well as right now we might be a bit short on things to recommend next season. In the end the final 2015 race was appropriate. The fare was rather lacking, so was the racing, while we had two Mercedes a way ahead of two Ferraris and the rest nowhere near - underlining the clout those two entities have these days with their fine engines (which extends to political power and other things they extend over the teams they supply). That the top ten in the final drivers' table are in Noah's Ark formation seems to underline the sport's current place also. If we can take anything from the state of F1 it's that there's a overpowering sense that the sport can't go on like this which presumably will be hard to defy, and we know from F1's previous such as the end of 1982 that it can take all staring over the precipice and coming to the realisation of what they stand to lose to bring the power-brokers round to the simple and glaring solutions that the rest of us came to a good while previously. Big changes aren't due until 2017 though and even there we might have doubts that they'll be the right ones. As Lewis noted after qualifying when the problem of cars not getting near each other is to do with aero quite why they're talking about dumping more aero onto the cars... "It shows for me that they don't know what they're trying to solve" he noted. 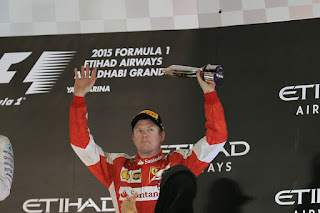 F1, not for the first time, goes Pythonesque. 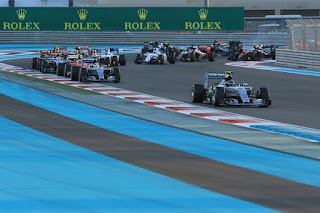 Kimi Raikkonen's drive to complete the podium today was solid, and it bagged him fourth place in the drivers' table, which it always looked like it was going to and was cemented when Valtteri Bottas collided with Jenson Button in the pits at his first stop, meaning a front wing change and a penalty. He finished well out of the points. Kimi as you'd expect was underwhelmed with the outcome: "You guys have been asking between me and Valtteri for a long time and still it doesn't make much difference to me. It's not what you think, a Finnish championship, it's a World Championship and there are winners it goes from there. If you don't win, it doesn't make an awful lot of difference if you're second, wherever you finish." Vettel as we've come to expect from him got himself into the picture as he does almost inevitably this campaign, and after starting way back this time before we knew it his back to front strategy, starting on softs, had him among the front runners. He eventually took fourth. While Sergio Perez continued his excellent recent form to finish fifth. A driver who previously had divided opinion and struggled for consistency now seems to have found a whole new level. A lot like our victor today seems to have also. Whatever else is wrong with this game, at least the 20 people that sit behind the steering wheels give us little to complain about.